Born and raised in Cajun Country, Louisiana, U.S.A., artist George Rodrigue portrayed on his canvas what he feared was his dying heritage---including its land, people, traditions, and mythology. As he often explained, he sought to “graphically interpret the Cajun culture,” preserving it in the face of a progressive world. Rodrigue’s art studies at the University of Louisiana at Lafayette and the Art Center College of Design in Los Angeles spawned one of the greatest success stories in American art. In the early 1990s his Blue Dog Series, based on the French-Cajun loup-garou legend, catapulted him to worldwide fame, while his dark Renaissance-like landscapes developed into robust modern masterpieces. 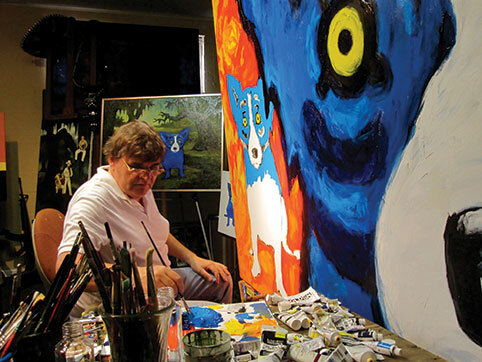 As a passionate philanthropist, Rodrigue founded the George Rodrigue Foundation of the Arts, advocating the importance of the arts in education. Programs include art supplies for schools, scholarships, and arts integration through Louisiana A+ Schools. Visit www.rodriguefoundation.org. Learn more about George Rodrigue on Wendy’s blog www.wendyrodrigue.com and the book The Other Side of the Painting (2013, UL Press). Born on March 13th in New Iberia, Louisiana, to George Rodrigue, Sr., a brick-layer, and Marie Courrége Rodrigue. Remains an only child. Diagnosed with polio in the third grade, and discovers painting. Following a full recovery, embarks on his life’s journey as an artist. Studies art at the University of Southwestern Louisiana in Lafayette, followed by the Art Center College of Design in Los Angeles. Returns from California to Louisiana, where he photographs and paints the mystical local landscape. Solo exhibition at the Louisiana Old State Capitol in Baton Rouge. Incorporates the Cajun people, traditions, and mythology into his landscapes. Receives a Gold Medal from the Academy of Literature, Arts, and Science in Rome, and a prestigious Honorable Mention from Le Salon des Artistes in Paris, prompting the French newspaper Le Figaro to name him “America’s Rousseau.” The Cajuns of George Rodrigue (Oxmoor House) is the first book published nationally on the Cajun culture and, at the suggestion of the National Endowment for the Arts, becomes an official Gift of State for the Carter White House. Paints the loup-garou, his first Blue Dog painting, as part of a collection of ghost stories (Bayou, Inkwell Press). Commissioned by the Republican Party to paint Presidents Ronald Reagan and George H.W. Bush. At the request of First Lady Nancy Reagan, paints three wooden eggs, now in the permanent collection of the Smithsonian Institution, for the White House Easter Egg Roll. The Rodrigue Gallery of New Orleans opens in the French Quarter. Paints Absolut Rodrigue and Absolut Louisiana as part of the worldwide “Absolut Art” campaign created by Andy Warhol and Michel Roux for Absolut Vodka. Book Blue Dog (Viking Penguin) sells 200,000 copies worldwide. Paints Louis Armstrong, Pete Fountain, and Al Hirt as official posters for the New Orleans Jazz & Heritage Festival. Commissioned by the Democratic Party to paint President Bill Clinton and Vice President Al Gore. Paints three covers for Neiman Marcus’s catalogue, THE BOOK. Publishes Blue Dog Man (Stewart, Tabori & Chang), accompanied by a 50-city U.S. book tour. Galerie Blue Dog opens in Carmel, California. Partners with the legendary ad firm Young & Rubicam to create a worldwide campaign for Xerox Corporation. Raises $500,000 for the American Red Cross following 9/11 and $2.7 million following Hurricane Katrina. Monograph The Art of George Rodrigue published by Harry N. Abrams, New York. 40-year career retrospectives at the Dixon Museum in Memphis, and the New Orleans Museum of Art break records at those locations for living artists or contemporary shows. Awarded Honorary Doctorate of Fine Arts by the University of Louisiana at Lafayette. Establishes the George Rodrigue Foundation of the Arts, advocating the importance of the arts in education. Honored as a Distinguished Eagle by the National Boy Scouts of America. Solo exhibitions at the LSU Museum of Art, the Acadiana Center for the Arts, and the Amarillo Museum of Art. Serves as Honorary Chair for the Carmel Film Festival. Receives the prestigious Opus Award from the Ogden Museum of Southern Art. We lost George Rodrigue to cancer in December 2013.